Indonesia is an archipelago country which has 95.181 Km a length of coastline, 17,480 islands, and has extensive sea around 5.8 Million Km2 consisting of the territorial sea which has an area of 0.8 Million Km2, archipelago sea which has an area of 2.3 Million Km2, and the exclusive economic zone which has an area around 2.7 Million Km2. Geographically, Indonesia is a maritime country that located between two continents, the continent of Australia and the Americas, and the two oceans that is the Indian Ocean and the Pacific Ocean. 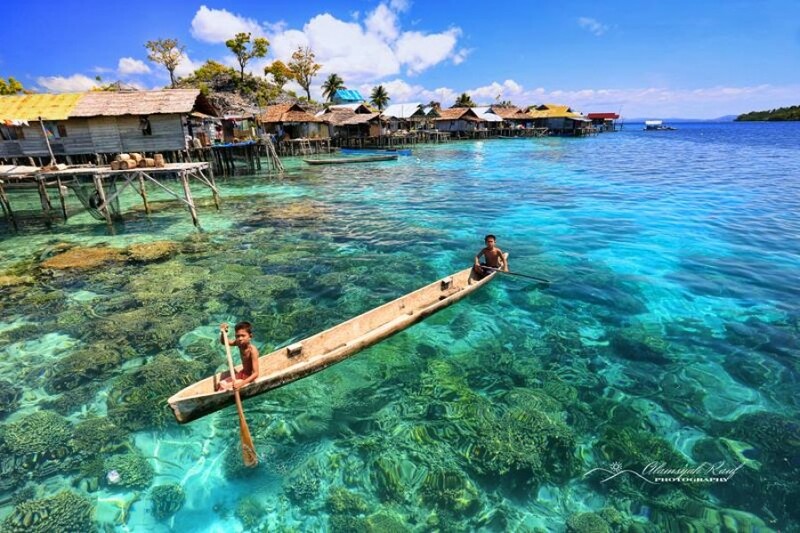 Besides flanked by two continents and two oceans, Indonesia is also directly adjacent to the neighboring countries such as Malaysia, Papua New Guinea, Singapore, and also East Timor in the sea area. As an archipelago country that has a strategic location, Indonesia often faced with threats in the sea area from various countries. These threats may come from countries bordering the sea area of ​​Indonesia or other countries. Some threats or problems in the territorial waters being faced by Indonesia such as a problem in Ambalat sea with Malaysia, the conflict in the South China Sea, and so forth. For the government of Indonesia, one of the threats that could threaten the Indonesia sovereignty is the conflict that occurred in the South China Sea. 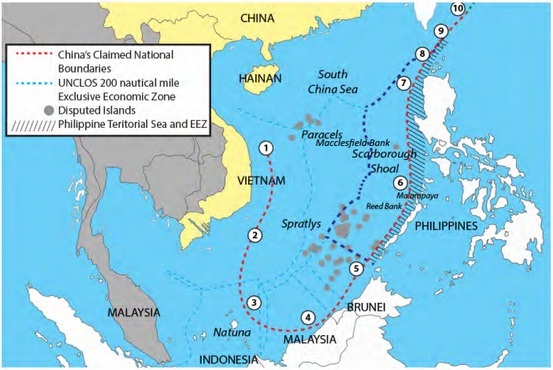 Although Indonesia is not included into countries that claim the territory located in the South China Sea. However, Indonesia has also started to be dragged into the conflict in the South China Sea. Indonesia began to be dragged into the conflict after the appearance of the map created by the Chinese governement that called the nine dash line, where on the map, one of the region within the exclusive economic zones of Indonesia, Natuna waters enter in. China’s claim to the waters of Natuna has happened since 2009. However, the claim began to re-appear when the incident of the Chinese fishing boat was taking fish in the waters of Natuna occured. Chinese governemt said that the fishing area is a “traditional fishing ground” belong to China. The Indonesian governemnt does not accept the statement created by the government of China. Due to the insistence of the Indonesia government, the governement of China finally recognize that Natuna is a part of Indonesia. However, although it has admitted that, the government of China still includes the territorial waters of Natuna in nine dash line map. Not only this problem, the Indonesia Navy (TNI AL) also had several times to deal with the Chinese Navy, People’s Liberation Army Navy (PLAN) in the Natuna Sea. Besides claiming the territory located around the South China Sea, China is also reclaiming the islands that were previously filled by corals. With the construction of reclaimed islands in the South China Sea area designated by China as a military base both sea and air can also be a threat to the countries bordering the South China Sea, such as Indonesia. Therefore, with the construction of military bases on the reclaimed islands, the threats coming from China not only come from the navy but also come from the air force. Therefore, the focus is on the procurement of guided missile destroyer by the Navy. The reasons for selecting guided missile destroyer because guided missile destroyer has features that can perform anti-air warfare, anti-submarine warfare and anti-surface warfare. So in my opinion, to have a guided missile destroyer, Indonesia has been able to prevent threats whether from land, sea, and air. The economic aspect is the most important aspect, because the economic aspect will affect how the amount of the budget provided for the purpose and interest of national defense. The total budget for the defense of Indonesia during the past few years have seen from the defense budget to state revenues or Gross Domestic Product (GDP) are still below 1% of total revenues or GDP. According Muhdjirin Effendi, a military analyst from the University of Muhammadiyah Malang, the ideal defense budget is around 8-10% of the state budget. According to Chief of Army Staff General, Pramono Edhie Wibowo, Indonesia’s defense budget has not been able to reach the Minimum Essential Force (MEF), because Indonesia’s defense budget is still below 1% of the total state budget. The low budget for defense because the government is still focused on improving people’s welfare. However, Indonesia’s defense budget in 2017 increased from the previous years ie 108 Trillion rupiah. According to the Minister of Defence, Ryamizard Ryacudu, most chances of the defense budget will largely be used to modernize the military weapons and will also be used to improve defense capabilities in the Natuna Islands. In my opinion, in order to improve the defense in Indonesia, the qualities and capabilities of military and defense equipment owned by Indonesia should be improved and modernized. In order to improve the quality and capability of the Indonesian military and defense equipment should be supported by the increased amount of the budget allocated for the purposes of national defense. As was mentioned above, that the government is still focused on improving people’s welfare. When using the principle of guns and butter so if Indonesia wants to improve the quality and capability of military and defense equipment to be able to maintain the sovereignty of the state, then the budget for defense needs to be improved and the budget for social purposes should be reduced. The transformation aspect can be seen from a fundamental change in the properties of the cold war era after the war. Technological advances also can be a factor that causes a change in the war that led to an argument that is going on Revolution in Military Affairs (RMA), which is a concept that can be influential in the development of the defense posture in many countries. In Southeast Asia, the countries that have adopted and made the RMA as a guideline in establishing a defense force, namely Singapore and Malaysia. For Indonesia, RMA referred as the basis for the transformation of the defense sector. The examples of the application of RMA in Indonesia was marked with the establishment of the Defense Ministerial Regulation No. 15 of 2009 on the Development of Technology and Defence Industry. Indonesian Defence Minister said that the RMA is one of the main factors that can give effect to the Indonesian defense policy and strategy. Although RMA is referred as the basis for the transformation in the field of defense, but until now, the implementation of RMA in various matters related to defense transformation in Indonesia has not been properly implemented clear. RMA in Indonesia called the Minimum Essential Force (MEF). According to the Regulation of the Minister of Defence of the Republic of Indonesia No. 19 In 2012, MEF is a major component of power development strategy towards the ideal. In MEF, there are two kinds of threats the first is the actual threat which is a threat that requires rapid treatment, because these threats can occur at any time, is unpredictable, and can be expanded from a local, national, and global. Some examples of actual threats such as terrorism, natural disasters, violations in border areas and outer islands, and so forth. While the second is the potential threat which is an imminent threat and predictable. Some examples of potential threats such as global warming, environmental pollution, pandemics, and so forth. The types of threats including into actual threats, because of the threat will come anytime and unpredictable, Indonesia needs to further develop the RMA factor in dealing with these threats. Because over the past two decades, the People’s Republic of China transform into a new world power both in economic and military. The economic rise of the Chinese People’s Republic began when the reign of Deng Xiaoping. In 1979, Deng Xiaoping made the People’s Republic of China in spite of the shackles of the national economy. From that time, China’s economy continues to grow rapidly and developed until now. Factor of economic progress is one of the factors underle the military build by China. The increase in military force by China is marked by an increasing number of military budget significantly each year. Military build up undertaken by China raises various concerns of other countries. They said that China will further strengthen its claim to the South China Sea region and also as a reaction to counterbalance American power. However, these statements were denied by the Chinese government. The increasion in China’s defense aimed for safeguarding the sovereignty, national security, and territorial integrity. Although the Chinese government deny these statements, but the Chinese government also said that his party does not deny that in order to maintain his country, China will strive to win the “war” related to territory disputes with other countries. China’s military strength is supported by the large number of military personnel and equipment owned by China. China has 2.3 Million active personnel and 1.2 Million reserve personnel. For the army, People’s Liberatin Army (PLA) has 1.9 Million personnel and 9,150 tanks, 4,788 armored fighting Vehicles (AFVs) 1710 self-propelled guns (SPGs), 6,246 towed-artilery, and 1,770 multiple-launch rocket system (MLRSs). In the air force, People’s Liberation Army Air force (PLAAF) has 470 thousand personnel and 1,230 fighters/ interceptors, 1,385 fixed-wing attack aircraft, 782 transport aircraft, 352, trainer aircraft, 802 helicopters, and 200 attack helicopters. In navy, People’s Liberation Army Navy (PLAN) has 250 thousand personnel and 760 warships, 1822 units of transport ships, 8 main port, 1 unit of the aircraft carrier, 21 units destroyer, 68 units of submarines, 42 units frigates, 368 units of coastal patrol boats, 39 units of minesweepers, and about 121 units of amphibious ships. Meanwhile, Indonesia has 395.500 military personnels. For army (TNI AD), Indonesia has 300.400 personnels and 468 units of tanks, 1,089 units of armored fighting vehicles (AFVs), 37 units of self-propelled guns (SPGs), 80 units towed-artilery, and 86 units of multiple-launch rocket system (MLRSs). For air force (TNI AU), Indonesia has 30,100 personnel and 35 units of fighters / interceptors, 58 units of fixed-wing attack aircraft, 170 transport aircraft units, 108 trainer aircraft units, 152 units helicopters, attack helicopters and 5 units. For the navy (TNI AL), Indonesia has 65,000 personnel and 10 units Corvettes, 2 units submarine and 3 units submarine result of cooperation with South Korea, 66 coastal defense craft units, and 12 units mine warfare. If seen from the number of personnel and military equipment, Indonesia is still far less than China. By having so many islands and communities, the number of personnel and military equipment owned by Indonesia is still less than adequate. Shortage of personnel and the number of military equipment owned by Indonesia can be a barrier to address emerging threats, especially threats in Natuna Islands. China as a country that entered into the South China Sea conflict began to strengthen its power by building the reclaimed islands for their military bases. Reclaimed islands located in the South China Sea will be made a military base that includes naval bases and air bases here are two kinds of functions of the construction of artificial islands in the South China Sea. The first function is strengthening China’s sovereignty claim and the second is as a container for the presence of China in the fields of military and civil. In addition to making the military base, China also put the ship during which accommodate 12 JI-2 ballistic missiles with nuclear warheads to patrol in the depths of the South China Sea. The Government of Indonesia also made a military base in the Natuna Islands. The construction of military bases will be conducted in six regions, namely Ranai, Sepempang, Seda Sungai Ulu, Strait Lempa, Desa Tanjung Payung, and Desa Tanjung Datu. Although the military base has not been completed, however, the military continued to expand the fleet of war in Natuna Islands. Aircraft alerted as fighter aircraft whose numbers continue to be added, the addition of one battalion to reinforce the naval base, increase the number of soldiers the Army, 7 warship used for patrol, 14 warships to monitor the South China Sea, the placement of radar that can monitor for 24 hours, and so forth. Indonesian government response in maintaining state sovereignty by building military bases and provide a fleet of fighter to keep an eye on Natuna Islands has been very good. However, when seen from the number of personnel and military equipment owned by Indonesia is still not much more and better than what is owned China as well as the manufacture of military bases both air and sea, the deployment of submarines to 12 ballistic missiles JI-2 nuclear warheads still giving the effect of a threat to Indonesia. Therefore, in accordance with the purpose of this paper is guided missile destroyer procurement by the Navy. Reclamation of the island carried out by China in the South China Sea which will be used as a military base both air and land and the placement of a submarine in the South China Sea region is the reason why I chose to hold a guided missile destroyer. The reasons for selecting guided missile destroyer due guided missile destroyer has features that can perform anti-air warfare, anti-submarine warfare and anti-surface warfare. In my opinion, to have a guided missile destroyer, Indonesia has been able to prevent threats whether from land, sea, and air. In addition, the guided missile destroyer procurement can also assist partners in prevent Indonesian military threats from China and also can participate in securing the sovereignty of the Republic of Indonesia. “The involvement” of Indonesia in the South China Sea conflict marked by the entry of the Natuna Islands into nine dash line created by China. Initially, China did not acknowledge that the islands belong to Indonesia or the Natuna Sea. However, because of the pressure given by the Indonesian government, the Chinese government finally willing to acknowledge that the Indonesian owned Natuna Islands. Although it has been admitted, but the region or the Natuna Sea Islands are still present in nine dash line created by China. In addition to the claim for the Natuna islands that could threaten the sovereignty of Indonesia, building islands reclaimed by the China designated as a military base both air and sea, as well as the placement of submarines to 12 ballistic missiles JI-2 tipped with nuclear explosions also a threat to Indonesia. In response to these threats, the Indonesian government has been building military bases in several areas in the Natuna islands. Although the Indonesian military development has not been completed, however, the military in maintaining the sovereignty of Indonesia have alerted various combat fleet. Warplanes alerted as fighter aircraft whose numbers continue to be added, the addition of one battalion to reinforce the naval base, increase the number of soldiers the Army, 7 warship used for patrol, 14 warships to monitor the South China Sea, the placement of radar that can monitor for 24 hours, and so forth. In my opinion, Indonesia’s response to the threat from China has been very good. However, when seen from the number of personnel and military equipment owned by Indonesia is still less and less good than what is owned by China. Therefore, in order to ward off the threat coming from China, I encourage the provision of guided missile destroyers. Selection of guided missile destroyer visits from threats that can come from the air force and the Chinese navy with submarines that were placed under the South China Sea. The reasons for selecting guided missile destroyer due guided missile destroyer has features that can perform anti-air warfare, anti-submarine warfare and anti-surface warfare, and to have a guided missile destroyer, Indonesia has been able to prevent threats whether from land, sea, and air. Besides the addition of military equipment, defense budget increase is also indispensable in maintaining and improving the defense of the Republic of Indonesia. Akmal. (2015). Strategi Indonesia Menjaga Keamanan Wilayah Perbatasan Terkait Konflik Laut Cina Selatan pada Tahun 2009-2014. Jom Fisip Volume 2 No.2 Oktober 2015, Universitas Riau , 3. Departemen Kelautan dan Perikanan . (2008). Evaluasi Kebijakan dalam Rangka Implementasi Hukum Laut Internasional (UNCLOS 1982) di Indonesia. Jakarta. Indriawati, V. Kebijakan Modernisasi Militer China era Hu JinTao (2003-2012). Yogyakarta: Universitas Gadjah Mada. Luthfi, R. M. (2012). Implementasi Revolution in Military Affairs (RMA) dalam Kebijakan Pertahanan Indonesia. Jakarta: Universitas Indonesia. Peningkatan Kekuatan Militer China. (2012, March). Info Singkat Hubungan Internasional Vol. IV, No. 05/I/P3DI/Maret/201 , pp. 5-6. SIPRI. Military expenditure by country as a share of GDP, 1988-2015. https://www.sipri.org/sites/default/files/Milex-GDP-share.pdf. Sungkawa, D. H. Geografi Regional Indonesia. Bandung: Universitas Pendidikan Indonesia.